I’m feeling sentimental about the eastern span of the San Francisco-Oakland Bay Bridge. Today is the last day it will carry traffic. 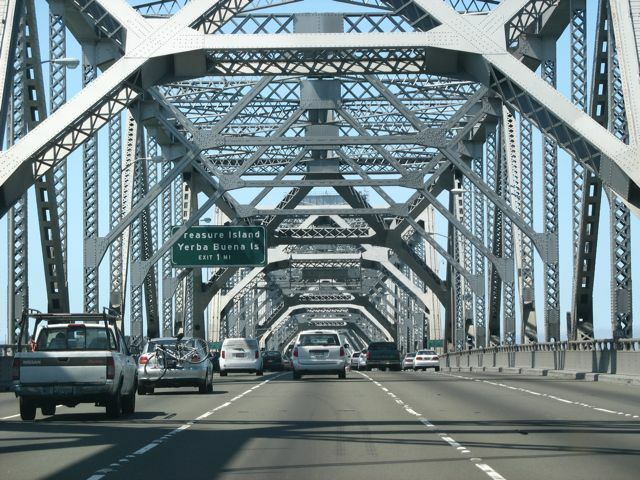 My earliest memories of the bridge are as a child, slumped in the back seat on long rides home to Berkeley from San Francisco or beyond, down on the lower deck where both spans look the same. Other than the tunnel through Yerba Buena Island and some glimpses of views between cars and girders, it could be a monotonous ride. But I’d found a way to make it fun. I’d discovered that the underside of the upper deck had sequentially numbered beams. I entertained myself by reading the numbers and seeing how high they would go before they restarted. A few weeks ago, crossing the bridge on the lower deck from my modern-day position in the driver’s seat, I heard my 8-year-old son and his friend refer to “the never-ending bridge” with fondness. I could relate. 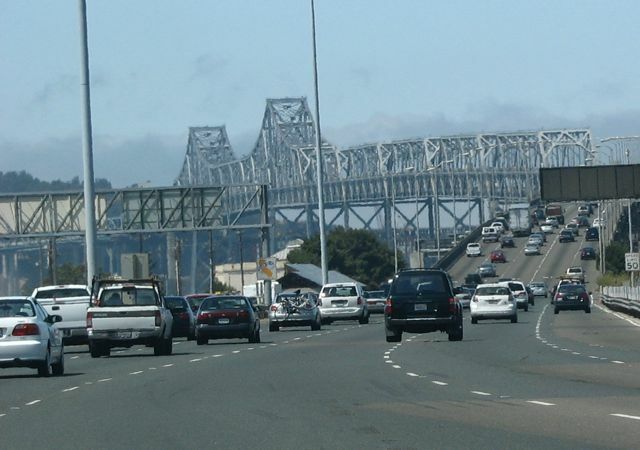 The eastern span has been the less glorious half of the Bay Bridge to be sure, and since it showed its vulnerability in the Loma Prieta earthquake in 1989, over half my life ago, its days have been numbered. Not new to sentimentality, I never sat comfortably with that plan—even before the ridiculous costs and delays. The impending absence made my heart grow fonder. I realized that on the upper deck I enjoy the geometric patterns, changing like a kaleidoscope as you drive along. A few years ago I was fortunate to be sailing under the bridge in a friend’s boat. I noticed that the eastern span’s supports sport the design element of criss-crossing metal between two sides that is in the towers of the western span. I liked that the two halves were visually tied together. Crossing the eastern span in recent years has offered the opportunity to witness a bridge being built up close (the new eastern span). I am impressed with people who create bridges. There is a certain audacity in building something over water that will hold the weight of concrete and millions of cars and people passing over. The new span, which I’ll miss getting to view from the old one, is a beauty. Despite its crazy costs and timeline, I am growing fond of it already. But for today, I say goodbye and thank you to the original eastern span of the Bay Bridge. Thank you for getting me and so many others to and from San Francisco, Oakland, and points beyond—for work, for visits with friends and family, for life events, for sights and music. Thank you for the views and the counting opportunities. Thank you for being part of the Bay Area.